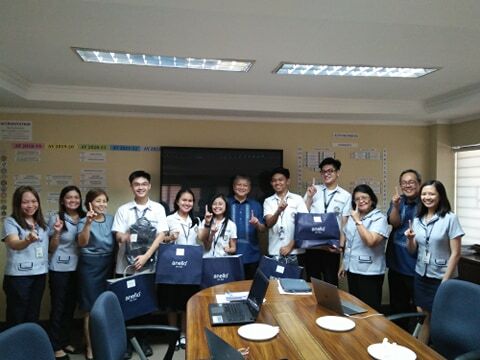 To acknowledge the victory of the University of the Assumption Junior High School Academic team, University President Fr Joselito Henson hosted a celebratory treat on March 22, 2019 at the UA Boardroom. During the gathering, the UAJHS team along with their coach Ms. Yanina Manalo shared their journey and experiences when they competed in the Patalasanlahi 2019 national competition. One of the members shared that a contributing factor of the victory is the support and push that they get from their school community. “I won’t forget the experience. I have found a family in them” he said referring to the academic team. The Office of the UA President also gave them presents as tokens of appreciation for a job well done. According to Ms. Edita Sagmit, UAJHS Principal, the victory of the UAJHS team is also the victory of the UAJHS family. She also said that because of their win, the UAJHS students had drawn inspiration from them which reflected to better results in the final examination. “We are very happy because you won the Patalasanlahi. All your schoolmates are really proud and they were really motivated to study harder,” said Sagmit.